Construction Estimator is an easy to use estimating program to help a contractor or home owner estimate materials and cost of a project. 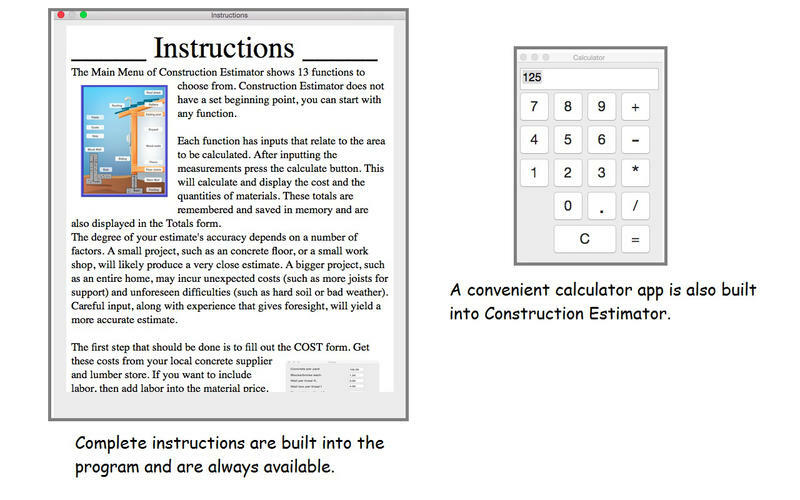 The main menu of construction Estimator shows 13 functions to choose from. Construction Estimator does not have a set beginning point, you can start with any function. Each function has inputs that relate to the area to be calculated. After inputting the measurements press the calculate button. This will calculate and display the cost and the materials. These totals are remembered and saved in memory. Totals are also displayed in the totals form. Many times you just need to get a quick estimate, this is where this program comes in handy. 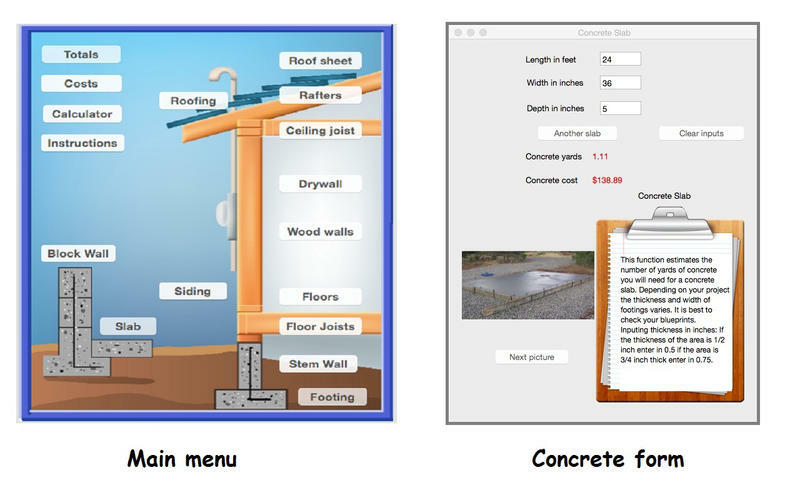 For example, you are going to pour a concrete floor, how many yards of concrete do you need for a 4 inch thick slab? or a 5 inch slab. After you have put in the gravel sub base you find out that the average depth is 5.5 inches deep. Do you spend the extra time and money to correct to depth to only 5 inches, or just pour a little more concrete. With this program you can quickly compare a depth of 5 inches or 5.5 inches. You can also use the Slab function to calculate the yards of gravel for the sub base. You can also use Construction Estimator in conjunction with other construction estimating programs. 2. Use your own judgment to add to concrete estimates. Unusual ground conditions and irregular dimensions make concrete estimates an imprecise science. It’s better to have some left over than to run out in the middle of a project. This will save the cost file. Corrected a few bugs, Concrete slab estimates the correct amount. Deleting totals in the Totals screen now deletes past input total amounts.